1.NAME OF THE PROJECT: Project for the Development of Cotton Khadi in the state of West Bengal. 2.LOCATION: Birbhum, Malda, Murshidabad, Burdwan, Hooghly, Burdwan(E), Burdwan (W), 24 Paragnas (North), 24 Paragnas (South), Howrah, Paschim Medinipur, Purba Medinipur, Nadia, Dakshin Dinajpur & Uttar Dinajpur in the state of West Bengal. 3.BRIEF DESCRIPTION OF THE PROJECT: Khadi is an Indian Fabric. There are at present more or less 500 families having 2500 individual Artisans associated with in the arena of Cotton Khadi in the state of West Bengal. There are about 80 Khadi Institutions and Societies which are working for production of Cotton Khadi in our state. Mostly they are producing traditional items of White Khadi and conventional items of Cotton Khadi. At present, there is a huge demand of Cotton Khadi in the domestic and international market. Production of Khadi took an important role in Indian freedom movement to discourage the Indians from wearing foreign clothes. Cotton Khadi yarn production below 100s count is considered as Cotton Khadi which is also known as Khaddar. Cotton Khadi Fabric being hand spun and hand woven bears the feeling of unique nature which is very much comfortable to the consumers as it feels warm during winter and cool during summer, due to unique character of hand spun hand woven fabric over mill made fabric. Cotton Khadi is eco-friendly which attracts the consumer to buy these products. Facing stiff competition with Power Loom Products as the cost of production in Khadi Sector is high. Artisans have health issues like pain in legs and hands, shoulder joint problem, spondylitis, vision problem and asthma. Cotton Khadi is hand spun & hand woven fabric and it is eco-friendly. 1. NAME OF THE PROJECT: Project for the Development of Silk Khadi in the state of West Bengal. 2. LOCATION: Bankua, Birbhum, Malda, Murshidabad, Burdwan, Burdwan(E), Burdwan (W), Paschim Medinipur, Purba Medinipur, Purulia, Dakshin Dinajpur & Uttar Dinajpur in the state of West Bengal. 3. BRIEF DESCRIPTION OF THE PROJECT: There are at present more or less 650 families having 4890 individual Artisans associated with in the arena of Silk Khadi in the state of West Bengal. There are about 188 Khadi Institutions and Societies which are working for production of Silk Khadi in our state. Mostly they are producing traditional items of Silk Than and conventional items of Silk Khadi products. At present, there is a huge demand of Silk Khadi in the domestic and international market. Silk Khadi is mainly produced in the District of Malda, Birbhum, Murshidabad, Paschim Medinipur, Bankura, Purulia, Paschim Medinipur and Purba Medinipur to some extent in the district of Burdwan(E), Burdwan(W), Dakshin Dinajpur & Uttar Dinajpur. Once upon a time Murshidabad Silk Khadi was famous in the domestic market due to the heritage skill of Silk Weavers. Silk Fabric is known as queen of Fabric which attracts the consumer to buy these products. • Facing stiff competition with Power Loom Products as the cost of production in Khadi Sector is high. • Artisans have health issues like pain in legs and hands, shoulder joint problem, spondylitis, vision problem and asthma. • Silk Khadi is hand reeling & hand woven fabric and it is eco-friendly. In the history of Textile in Bengal, 'Baluchari' came much after 'Muslin'. Two hundred years ago Baluchari was used to be practiced in a small Village called 'Baluchar' in Murshidabad District, from where it got the name Baluchari. In the eighteenth Century Murshidkuli Khan, Nawab of Bengal patronized its rich weaving tradition and Baluchari flourished from that time onwards. But this flourishing trend later declined, specially during British rule, due to political and financial reasons and it becomes dying craft, as most of the weavers were compelled to give up the profession. 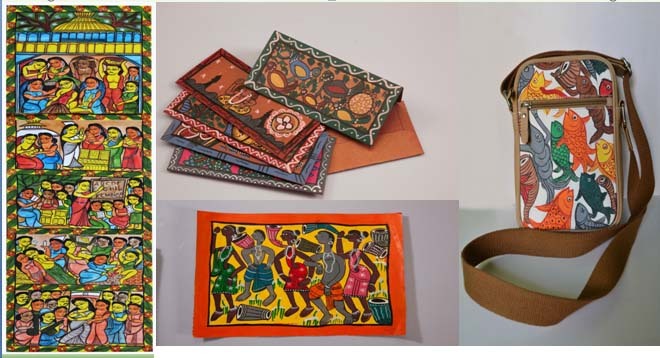 Later in the first half of twentieth Century, Subho Thakur, a famous artist, felt the need of recultivating the rich tradition of Baluchari craft. Though Bishnupur was always famous for its silk, he invited Akshay Kumar Das, a Master Weaver of Bishnupur to his Centre to learn the technique of Jacquard weaving. Sri Das then went back to Bishnupur and worked hard to weave Baluchari on their looms. Once Bishnupur was the capital of Malla dynasty and different kinds of crafts flourished during their period under the patronage of Malla kings. Temples made of Terracotta bricks were one achievement of these rulers. A major influence of these temples can be seen in Baluchari Sarees. Mythological stories taken from the work of temples and woven on Baluchari Sarees is a Common feature in Bishnupur. Project of Common Facility Centre for Baluchari Saree at Sonamukhi Block, Dist: Bankura.Baluchari Saree is one of the most beautiful, elegant and exquisite Khadi product in Silk Khadi Industry which is produced by skilled Artisans and weavers at Bishnupur/ Sonamukhi in Bankura District. Construction of common facility centre at Sonamukhi Block under the District of Bankura has been set up by WBKVIB with a view to facilitate the Baluchari weavers to have better work place to work on and the centre acts as CAD (Computer Aided Design). Centre for improving design of Baluchari Saree with the help of Computers. Suitable training programme has been organized for imparting training to the semi- skilled weavers under the guidance of "Sonamukhi Resham Shilpi Samabaya Sangha Ltd., Sonamukhi" Common Facility to be provided for producing 500 No. or Baluchari Sarees with innovative Design and to impart Training to 60 Nos of weavers. Common Facility Centre of Baluchari Weaving & Training at Sonamukhi, Dist: Bankura Phone No. :- 9933467794. Apart from Bishnupur Sonamukhi is also a major & famous Silk weaving Centre of the District as well as state. The weavers of Sonamukhi & its adjacent area are producing good quality silk fabrics specially *Garad' than (fabric made out of twisted yarn) and other shirting & suiting, and earned reputation throughout the country. Considering the skill of weavers and their interest in Jacquard weaving, West Bengal Khadi and Village Industries Board has planned to set up a Common Facility Centre at Sonamukhi with a view to provide skill development training to the weavers in jacquard weaving, specially Baluchari weaving, its designing, and diversification. A computer aided design centre (CAD) will also set up at the C.F.C. to cater the requirement of Khadi Institutions, for improving design of Baluchari Saree and other high value fabrics. 4.Production Target per annuam (Baluchari Saree):500 pc. Natural fibers such as jute, silk, coir, bamboo, sisal, mat grass, babui, cotton(handloom) etc. are indigenously available in many backward districts of West Bengal. In the context of developing the inherent skills of the rural community and womenfolk in select blocks of backward districts of the state, a Scheme for implementation of the Natural Fibre Mission was proposed by the directorate of M&SSE, Govt. of West Bengal under the aegis of the Special Backward Region Grant Fund. The project, in principle has been approved by the Planning Commission, Govt. of India. The project envisages the development of the Natural Fibre sector in select districts of West Bengal through multi-level interventions at the apex layer. The task of handholding projects and the groups of entrepreneurs implementing the projects under the Scheme is very complex and needs intensive handholding support. It is in this context that the Directorate of M&SSE, Govt. of West Bengal is preparing this Detailed Project Report (DRP) for implementation of the scheme in the selected districts of West Bengal. 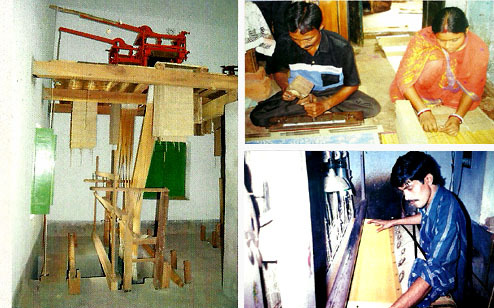 The Natural Fibre Mission Project funded under BRGF concept is based on generation of rural livelihood, creation of rural industries, through intervention of product diversification, market linkage, creation of infrastructure facility like Common Facility Centre (CFC); Common Production Centre (CPC) including soft intervention and household level intervention like supply of machineries, tool kits, equipment etc. The prime objective of the Natural Fibre Mission is to institutionalize the use of natural fibres available in the districts through development of community-centric manufacturers’ cluster by using the available traditional skills, business development services of the community by way of providing synergic linkages for a sustainable development of the community with inclusive growth of the sector. Thus the Mission aims at promoting the artisans pursuing trade of the available natural fibres by providing forward and backward linkage in terms of improved tools, raw materials and market support. WBKVIB has been involved in the process of implementation of NFM project under BRGF Districts and other Districts for having Livelihood Development of Artisans engaged in the activities relating to Sabai Grass, Sisal, Cotton Fibres in Purulia, Bankura, Midnapore (W), Birbhum, Malda, Murshidabad and Midnapore(E) district. Baseline survey regarding availability of Natural Fibres [Jute, Silk, Coir, Bamboo, Mat Grass, Babui grass etc. ], No. of artisans, present status of products including value added products, scope of exports etc. have been made. Planning Commission, Govt. of India has principally approved a fund of Rs.257 Crore for this project. West Bengal Khadi & Village Industries Board currently working in the following districts with the types of fiber given below. Where as Financial Allocation Rs 37.00 Crores. Coverage of Benificiaries 6319 Nos. Patachitra and Pater Gaan are unique cultural traditions of Bengal. The patuas paint stories on long scrolls of cloth. The most unique thing is that all the colour used by the artists are the natural ones, extracted from different vegetables, fruits and flowers. Social themes like protection of environment, planting of trees etc have also placed in their creation. The village is home to around 250 Patuas, a unique tribe of folk artists who are painters, lyricists, singers and performers all in one. The artists have organized themselves under chitratare cluster. POT Maya is an annual festival held at Naya, Pingla -a hub of scroll painters of Bengal, called Patuas. Patachitra, an age old tradition of the Patuas, is aunique form where oral tradition meets the visual structures of a narrative. The painters today have painted their path to glory drawing audience both national and international to their now famed dwelling. The Department of MSME&T, Govt of West Bengal in association with UNESCO has taken an initiative of developing this place as Rural Craft Hub, to be managedby the Patuas. WBKVIB has assigned by Govt. of W.B, for taking up the hard intervention part e.g. construction of common facility centre, providing working capital and so on and soft intervention part has been taken up by UNESCO through its local partner BanglaNatok Dot com. By Car: 1 30 kms from Korkata. Reach Debra along NH 6 and take left turn to Balichak. From Balichak move towards Mundomari crossing and then take left to reach Naya, Pingla. By Train: Take a train to Balichak from Howrah. From Balichak take a bus or a car to Naya, Pingla. Before boarding the local from Howrah please check whether train stops at Balichak.